A 16-bit Tactical Platformer set in a world where ancient technology is wielded like magic. 4,077 backers pledged $145,815 to help bring this project to life. In a world where control over ancient technologies means power, a ruthless Empire has arisen. You play as a pair of Ruinhunters searching for the one thing that can save their village - a legendary weapon known as Aegis. 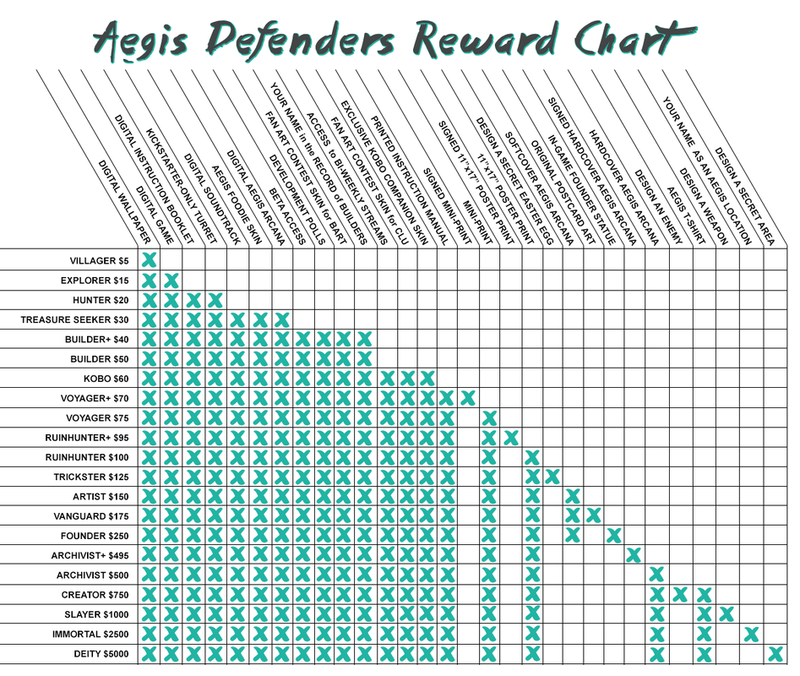 MISSED YOUR CHANCE TO BACK AEGIS DEFENDERS? BACK WITH PAYPAL & HUMBLE ON OUR WEBSITE! Update 12: We are GREENLIT! Update 14: Crossover Gameplay Videos! Level up and customize unique character classes - Engineer and Hunter to start. Monk and Assassin are stretch goals! With the right materials, the engineer can also craft new weapons and unlock new abilities for the other classes! Fight off enemies from all sides - but you won't have to do it alone. With Dynamic Character Swapping, switch between multiple characters on the battle field, position your characters carefully, and utilize their passive abilities effectively to survive. Various Tower Defense Scenarios- Defending one point can be hard enough but that's just the beginning. As the game progresses, you'll need to defend moving targets, targets that have dynamic abilities like activating doors/weapons, and even targets that don't want to be protected. Too dangerous to go alone? One of our first stretch goals is to add local cooperative multiplayer! *Note that this screenshot is still playable in single player mode with Dynamic Character Swapping. Aegis Defenders will be available for Windows and Mac. The full release will be distributed on Steam as well as DRM-free download. Playstation 4 and Wii U are definitely stretch goals! We are also very interested in other consoles, handhelds, tablet, etc and will make decisions about those versions based upon success of this campaign, interest and opportunity. Aegis Defenders had its start as a graphic novel with a rich lore and backstory and we envision this game as a venture into a vast, fantasy universe. Aegis Defenders takes place in a world where a great war has wiped humanity's memory clean of its once technologically advanced past. Once commonplace items like microwaves are seen as black magic. Humanoid artificial intelligence that demonstrate supernatural strength and intellect are regarded as gods. The core story is about the relationship between Bart and his granddaughter Clu (Yes. She's a girl). Many years ago, their home was destroyed by the demi-god Shem, one of the robotic gods who has been programmed to preserve the lives of his people at any cost, and now Shem is expanding his dominion once again. Aegis Defenders focuses on their journey to stop Shem from invading their new home of Mu by finding Aegis, a mythical weapon said to endow its bearer absolute power. A tinkerer with knowledge of the old world, Bart's determination and ability to bring relics back to life is second to none - even when it is deemed forbidden. Despite his carefree exterior, Bart is burdened with a heavy guilt from his past. As an engineer, Bart is able to craft static defenses like turrets, barriers, and drones. Bart isn't great at melee combat but he wields a giant hammer that can be used for melee combat in a pinch. When not the active character, Bart's passive ability is to repair nearby structures. As an orphan whose parents were killed by the Empire, Clu has difficulty trusting others and puts others at a distance with her her sharp tongue and knack for sarcasm. The lucky few that she does befriend, however, she loves absolutely. Clu wields a variety of powerful firearms - ranging from crossbows that can shoot platformable bolts to shotguns with powerful knockback. From explosive mines to slow fields, Clu can be set deadly traps that offer a wide range of utility. Clu's passive ability is continual fire, allowing her to function like a mobile turret. Energi Glubs - Remnants of an ancient power source known as Energi, these gelatinous foes live only to eat and will devour your turrets and defenses like candy. The Order of Shem - The Empire's foot-soldiers always travel in groups and must be dispatched of from afar. Their long spears and hardened shields make them impossible to approach up close. Check out more enemies on our Tumblr! Arachnis the Spider Queen - Fun fact about Arachnis and her children: their butts are shaped like fruit. At the right angle, the babies look like peaches and the queen looks like a dragon fruit. Yummy! Ragworm of the Nereis Desert - These blind critters have acute hearing and will attack anything that sounds like it might be dinner. A more prudent engineer might be able to lure these guys out with kamikaze drones. Digital download does not include physical CD or iPhone. The printed, physical softcover Aegis Arcana is available at the Artist Level ($150) and above. The signed, hardcover Aegis Arcana is available at the Archivist level ($500) and above. We'll be holding a Fan Art Contest in which fans will be able to design a alternate skin for Bart up until the end of our KickStarter (See complete details here)! Once the contest is over, members of our BETA PROGRAM will be able to vote on the winner! The winning design will then be converted in a special edition skin for all backers who pledge at the Builder Level ($40) or above. We'll be holding a Fan Art Contest in which fans will be able to design a alternate skin for Clu up until the end of our KickStarter (See complete details here)! Once the contest is over, members of our BETA PROGRAM will be able to vote on the winner! All Digital items! Perfect for International backers! No shipping required! Note: Images are mock-ups of works in progress! Final product may be updated and refined. Note: Images are mock-ups of works in progress! Final product will be updated and refined. The subject matter of the art is also up to the backer (with some minor limitations). If Bart's blathering is to be believed, the temple also contains a special weapon, wieldable by only the handsomest and smartest of grandpas. Taking the game to a publisher or another funder would mean that we'd have to compromise our vision for Aegis. Kickstarter allows us to reach out to our audience directly, to people who truly believe in the idea of the game and the story, and ultimately, make the game as amazing as it can be for everyone! Every production will have its challenges. Making something great takes a lot of time and effort! We have invested not only our time and effort, but our own money into making this game. We believe in it and we wouldn't be asking for your help on Kickstarter if we weren't completely and fully committed to bringing the game into existence! We take your trust in us seriously and are excited to deliver you an amazing game! We're confident in our budget and timeline and have a great advisory team backing us up, but of course, our release date for the game is still an estimate. It's a very well-researched estimate based on our experience and the experience of our advisors. Should anything take longer than expected, we promise to be transparent about any date changes as early as possible with our backers because you deserve to know. Making the game an awesome experience is our priority. Even prior to the Kickstarter, we showed it at E3 Mix, Anime Conji, and Anime Expo to make sure that we had something fun and enjoyable! And of course, we will still plan for backers in the BETA program to experience the game during development to help us make an awesome game! + EXCLUSIVE WALLPAPER from Aegis Defenders! This will be created during our LiveStream on the final day of our KickStarter! + ONE (1) COPY OF THE GAME for PC or MAC - Includes crossover skins like Lunais from Timespinner and more! More to be revealed during the Kickstarter! EXCLUSIVE AEGIS FOODIE SKINS - food-themed skins for Bart's Defense Block and Clu's Explode Trap! All digital items! Perfect for International backers! + PRINTED INSTRUCTION MANUAL - just like the one you used to get in the box! + KICKSTARTER EXCLUSIVE 11x17 PRINT on 100# French Paper. + SIGNED & NUMBERED HARDCOVER AEGIS ARCANA - a beautiful art book and world guide with an alternate cover! + SIGNED HARDCOVER AEGIS ARCANA - a beautiful art book and world guide with an alternate cover! + T-SHIRT - Large, illustrated screenprint designed by Bryce Kho on American Apparel 100% Cotton T-shirt! + HONOR AND GLORY - One of the in-game locations of Aegis will be named after you (or alias) and your likeness will adorn its halls! + DESIGN A SECRET AREA with our designers through Skype or in-person (travel not included) that's totally up to you! Fill it with whatever your heart desires!